The cheeky yet helpful illustration is inspired by the artist’s love of entertaining at home. 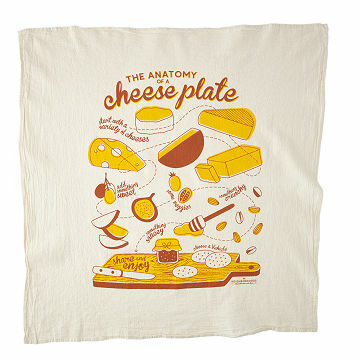 Couldn't tell you where our spleen is, but the anatomy of a cheese plate? We have that down to a science. So does Jodi Kostelnik: She designed this cheeky (yet helpful dish towel). The illustration is inspired by her love of entertaining, and it highlights everything you need for a successful fromage experience, from "something sweet" to "share and enjoy." Give one to the host who knows their nutty pecorinos from their stinky taleggios— you can even use it to wrap up a lovely serving board. How's that for a little green with your blue? Designed and packaged in DC. Printed on 100% cotton in Wisconsin. Jodi Kostelnik creates decor with delicious imagery so she can share her artwork with the masses. Jodi pulls inspiration from her local farmers markets in Washington D.C. and even finds grocery stores mesmerizing, with all the produce section’s vibrant colors, shapes, and sizes. Her passions come together in a batch of fresh and playful illustrations she hopes will brighten homes and make people smile.